"With unrelenting logic Shue recommends that American law be broadened to require the termination of aid not merely to those governments that engage in shocking and outrageous conduct but to those countries indifferent to the rights of their citizens to food, shelter, and health care. Shue has written the classical statement affirming that the rich nations are required by justice and by international law to share their abundance with those millions who are chronically malnourished. 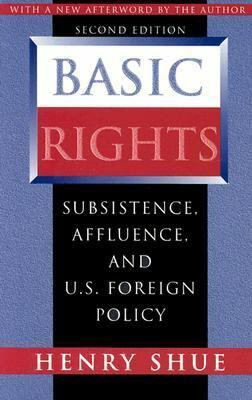 "Shue, Henry is the author of 'Basic Rights Subsistence, Affluence, and U.S. Foreign Policy', published 1996 under ISBN 9780691029290 and ISBN 0691029296. Loading marketplace prices 146 copies from $7.70 How does the rental process work?